When you are assembling a new computer, don’t give in to the temptation of buying a cheap power supply unit (PSU). The PSU supplies power to your entire system, and a bad one can cause that expensive motherboard or graphics card to malfunction. Don’t take this risk, ever! PSUs don’t have the same marketing or glitz value as graphics cards or processors. You know that you want Intel’s new Skylake CPUs Intel Skylake CPUs: 3 Things to Know Before Upgrading Intel Skylake CPUs: 3 Things to Know Before Upgrading Thinking of upgrading to an Intel Skylake CPU but not sure if you should? Here's what you should know to help make that decision easier. Read More and you’ll endlessly debate Nvidia vs. Radeon, but chances are, you’d go with just about any PSU, right? That’s a mistake — one that will cost you big time. That’s not to say that you need an expensive PSU. There are budget models available, which fit the idea that it’s cheaper to build your own PC Is It Still Cheaper to Build Your Own PC? Is It Still Cheaper to Build Your Own PC? How much does it cost to build your own PC these days? Compared to pre-built models, are the savings worth the effort? We investigate. Read More . But you need to know what to look for. So here’s a quick guide to selecting the right PSU without breaking the bank. Wattage is the base number to help you distinguish which PSU you need and how it is rated. Simply put, this is the total amount of watts the PSU can deliver to the different parts of your PC. You’ll find models that provide 300W and some that go all the way up to 1200W. While models will advertise this number proudly on the box, it might not tell you the full story. Power Supplies Explained: How To Pick The Perfect PSU For Your Computer Power Supplies Explained: How To Pick The Perfect PSU For Your Computer Most geeks interested in buying new hardware or building a new system think first of the processor, graphics card and perhaps the hard drive. These components have the most impact on performance, so they are... Read More For example’s sake, consider a hypothetical 500W PSU. If it means Continuous Wattage, that’s great. If it’s the Peak Wattage, you might want to avoid it. You can usually check which it is on the model’s specifications page. Continuous Wattage and Peak Wattage are ratings based on tests by the manufacturer. Continuous Wattage indicates that it can deliver those 500W continuously without fluctuations. Peak Wattage indicates 500W is the maximum power it can deliver, but probably only for a minute before dropping down. In simple buyer terms, look for continuous wattage ratings, ignore peak wattage ratings, and ignore a product that doesn’t advertise its continuous wattage rating. If you can’t tell which one it is, don’t take your chances and just move on. 2. How Many Watts Do You Need? Not all PCs are built alike, so the amount of power each one needs is different. A high-end gaming PC is obviously going to need more watts to run than a simple home office PC. But how do you calculate the amount you actually need? The Internet is full of simple calculators that will do the job for you. Try Outervision’s Extreme Power Supply Calculator or Cooler Master’s Power Supply Calculator. If you know what you’re doing, Cooler Master’s version is better, but if you’re not sure about what parts the calculator is asking for, stick to Outervision’s basic calculator. Both calculators will give you a certain idea of how much wattage you need, and depending on how you entered your information, feel free to round it up to the closest PSU. In fact, you could even go two rungs higher. For example, if the calculator says you need 370W, then a 400W PSU should be fine but 500W wouldn’t be bad either — especially if you plan on adding more parts to the rig eventually. Our social responsibility to the planet compels us to not consume more resources than we need to, so get a PSU that is as efficient as possible! Even if you don’t care about the planet, an efficient PSU will still save you big bucks on your energy bill. So what is efficiency in a PSU? Build Your Own Low-Wattage PC with Three Simple Design Rules Build Your Own Low-Wattage PC with Three Simple Design Rules After a few failures and experiments building my own fanless, highly efficient computer, I can share three low-wattage builds designs that dispense with most moving parts and minimize the number of fans used. 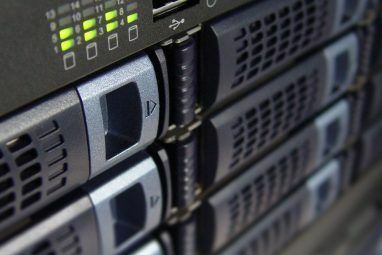 Read More Well, your PSU is taking AC power from the outlet and converting it to DC power, which is then sent to all the parts — but typically the PSU wastes some energy in the conversion process. Therefore, PSU efficiency is about how much it can convert and how little it wastes. Therefore, an 80% efficiency indicates it’s able to convert 80% of the AC power to DC while 50% efficiency indicates it converts 50% of the AC power to DC. In even simpler terms: a higher efficiency percentage is better and will require less power from the outlet. An additional advantage of these efficient PSUs is that they generate far less heat than other PSUs, and usually run at quieter volumes too. Manufacturers will advertise 80 Plus certified PSUs proudly, but in case you’re having trouble finding information, check the full list of 80 Plus PSUs. Everything up to now has just been about the bare basics of PSUs. 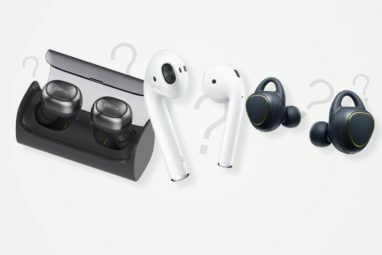 As with any technology, you can geek out and get a lot more specific about what you want or need, but if you are a beginner, the aforementioned three aspects will matter the most to you in your buying decision. That being said, there’s some other jargon you might encounter while shopping for a PSU. You can safely ignore all of this until you’re more familiar with PSUs in general, but if you’re curious about what they mean, here are some specs you might see. Rails: You can get multi-rail or single-rail PSUs. Both have their pros and cons and you don’t need to worry about the technicalities right now. If you live in an area where power fluctuations or outages are normal, then you should consider multi-rail. For any other scenario, or if you use a good uninterruptible power supply (UPS) 5 Things You Need To Know In Order To Buy The Right UPS 5 Things You Need To Know In Order To Buy The Right UPS Power is unpredictable. A car crashing into a pole can cause a blackout or a surge strong enough to destroy most electronics in your home. That's why you need an uninterruptible power supply (UPS). Read More , then just get a single-rail PSU. Voltage Stability: If you’re ticking all of the above boxes, then voltage stability won’t be an issue. This basically refers to the PSU’s ability to keep supplying power at 12V without dropping. Cabling or Connectors: Unless you’re buying a high-end specialized PSU, you should be fine with the cabling that comes in the box. High-end PSUs do offer something called “modular cabling”, which lets you fit custom cables and pin connectors to attach your parts to it. Not important for the average user. AT vs. ATX: Some PSUs are made for AT-type motherboards, others for ATX-type, and some for both. Chances are, you’re using a standard ATX motherboard and will need a standard ATX PSU, but you may want to double check your motherboard’s details just in case. Repair Units and Accessories: No, you don’t need a wattage tester or guides on how to fix a PSU. If you diagnose a problem with the PSU How To Diagnose Hardware Problems When Your Computer Won't Turn On How To Diagnose Hardware Problems When Your Computer Won't Turn On Last week I showed you some of the simplest DIY repairs and upgrades that you can do yourself, but one reader asked how to diagnose which component was the problem. Today I’d like to walk... Read More , your only option is to replace it — and hope that it’s still under warranty. So why are we harping on about buying a quality PSU instead of just going with whatever came bundled with your PC case or a relatively unknown brand’s models? Well, like we said at the start, your PSU affects every part in your computer system and can end up frying circuits in the case of a power fluctuation. They last a long time. No, really. Chances are that if you buy a quality PSU right now, rated about 100W to 200W higher than what you currently need, then you’ll be able to use it for your next PC upgrade Can I Reuse My Old PC’s Power Supply In A New Computer? Can I Reuse My Old PC’s Power Supply In A New Computer? One of the best ways to reduce the cost of upgrading your PC is to simply re-use the components which don’t need to be upgraded. Yea, you’ll have to replace the graphics card or processor.... Read More as well. At the very least, it’ll last you several years. They have resale value! Upgrading to a new PSU? You’ll find buyers for your old one on Craigslist and Ebay. Heck, you could even repurpose it as a bench power supply How to Make a Bench Power Supply From An Old ATX PSU How to Make a Bench Power Supply From An Old ATX PSU If you have an old computer ATX PSU lying around, you can give it new life as a bench power supply. Here's how. Read More for DIY projects. Standardized sizes let you get creative with old PSUs too. 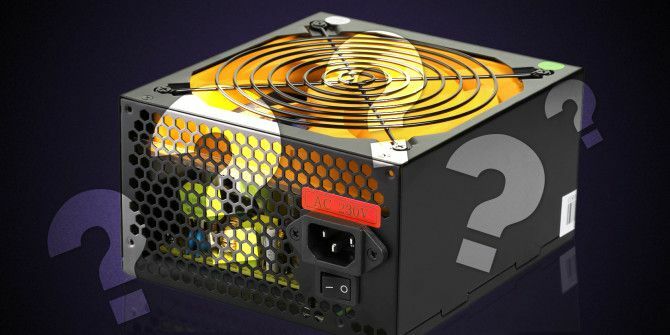 Since all PSUs are generally shaped the same, just find a simple case and you can make yourself a cool and quiet HTPC Media Streamer, Media Player or HTPC: Which One Is For You? 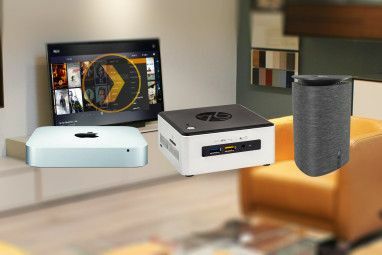 Media Streamer, Media Player or HTPC: Which One Is For You? Read More . Manufacturers release new PSU models at a quick rate, and it’s a relatively niche computer part for tech reviewers. Here are a few well-known and reputable brands to start you off: Corsair, Cooler Master, Antec, Be Quiet, Seasonic, and XFX. These aren’t the only ones, of course. Once you’ve gone through the aforementioned steps, you should have a fair idea of how many watts you need, which trusted brand models are certified 80 Plus for that wattage, and what fits in your budget. Now it’s time to actually do some research. Jonny Guru is considered one of the most reliable Internet voices for advice on PSUs. You can search for your product on JonnyGuru.com, check out the JonnyGuru Forums to find help, or rely on his legendary PSU Tier List to find the right model for you. As for other general tech sites, Tom’s Hardware and AnandTech are renowned for their in-depth PSU reviews and are known to have knowledgeable commenters who will share extra information and their own experiences. Again, both sites have forums with an active community of helpers. Finally, if you need to people to talk to, head over to /r/BuildAPC on Reddit to find out which PSUs people are leaning towards these days. Have Any Questions on PSUs? With PSU brands, personal experiences add a lot of value. So tell us which power supply unit you’ve currently got and which brands have earned or lost your trust. I’ve personally shifted from Corsair to Cooler Master and found that CM has been much more reliable. Hope this helped! If you have any further questions, ask down below and we’ll try to help you. Are there any other tips we missed? Share them with us down below, too! Explore more about: Buying Tips, Computer Parts, Energy Conservation, Hardware Tips. Just to comment to thank you for this most informative article about choosing PSU! Is atx psu compatible with Mini atx motherboard? How to know that PSU have "Continuous Wattage Or Pick Wattage". Currently using a Corsair VS550. No complaints so far! What are the technical specifications to be taken before carrying out a PSU upgrade? I've got an elderly Compaq Presario desktop from 2005. I inherited it from my sister, when she upgraded to Win7 a couple of years ago. It came with a generic 'silver box', which was only rated for about 280W. I've upgraded quite a few components, although not a graphics card.....I have no need for one. Just to be on the safe side, I bought a new PSU; a 500W, CoolerMaster B50 single-rail. Runs a fair bit cooler, and quieter, too. I've got no complaints with it! In over 20 years of building and rebuilding PCs I have purchased exactly ONE PSU. It was for my first DIY project and it was a budget model. After that I have used only PSUs I have pulled from old computers which means most, if not all, were whatever the box maker stuck in there. In all of that time I have never had PSU problems. If they worked when I pulled them out, they continued to work. However, I must confess that I am not a heavy gamer, I do not run server farms and I do not run climate predictions for National Weather Service. IOW, I do not stress the PSU. DISCLAIMER: The above is anecdotal and based on MY experience. It is no way to be construed as a recommendation of any kind. You should do whatever you think is necessary and whatever you feel comfortable with. ...Then You Can Build Your Parts List In PCPARTPICKER ( PPP ). F - Be Warned If Your Build Has Any Compatibility Issues. Welcome, But I Can Not Take The Credit. When PCWORLD Dropped Their Forums, I Was Left With The Need To Find Another Friendly Site Where I Could Both Receive And Give All Kinds Of Advice. It Did Not Take Long For Me To Find SCFORUM - The Credit Is Entirely Theirs. Weight is a pretty reliable indicator of quality for PSUs. a 1kW power supply probably weighs 2.5kg or so. If you have an opportunity to actually hold a cheapie in your hand at the same time as a nicer model, you'll be able to tell the difference immediately. A quality power supply won't have much empty interior space. For the most part, you probably don't need as much power supply as you think you do. There are exceptions, like people who want to run an SLI config, or folks like me who have single systems with 30 installed hard drives, but for the most part 500W will see you through, even if you have a pretty beefy video card, and 150W can comfortably take care of a basic-issue i3 office desktop. If you have serious low-power aspirations, there's such a thing as a PicoPSU, which basically moves the guts of a power supply into a laptop-style transformer. These guys are small and fanless and are available in sizes up to 150W. Finally, if you have a mission-critical desktop and you care enough to blow $200 on a high-end power supply, do please take the time to get a battery backup to go with it. That's another whole can of worms, but anything that will run your PC long enough to let it shut down in an orderly fashion is going to save you heartache down the road.